Ben Feldman of Westhill/Stamford swims in the 100yd butterfly during the CIAC Class LL swimming championships at the Freeman Athletic Center, Wesleyan University on Wednesday March 14, 2018 in Middletown, Connecticut. Megan McGorry is in her first season as coach of the Cheshire boys swimming team, but she’s certainly no stranger to the state’s swim scene. McGorry arrived at Cheshire after guiding the Hamden boys squad for four seasons and serving as an assistant girls coach at East Haven for one year. A 2007 West Haven High School graduate, McGorry was an all-state swimmer for the Westies, before taking her swim skills to Central Connecticut State University and Fordham University. Now she’s heading Cheshire’s traditionally strong program, which has continued to thrive. Heading into Thursday night’s home meet against SCC rival Daniel Hand, the Rams sported a record of 8-1, with their only defeat coming against conference foe Fairfield Prep. So indeed, things have gone swimmingly for the Rams and McGorry. Cheshire’s first-year coach knew she was taking over a squad that placed a strong ninth as last season’s Class LL championships and 12th at the State Open finals, but she’s pleasantly surprised at the consistent performances she’s seen from each competitor. Junior Sam Hanke is one of the swimmers who has sparked the Rams. Hanke placed eighth in the 100 backstroke at last season’s Class LL finals (54.38) and was 12th at the State Open. He also had a top-20 finish in the 200 freestyle and continued his success in each event this winter. Hanke has provided plenty of points for the team by posting impressive times in the 200 freestyle and 100 backstroke. The relay events have also seen him make his mark. Like last season, senior Joseph Cannata, one of the captains, has excelled in the 100-yard breaststroke and 200 individual medley. Cannata, who will swim at Fairfield University next season, has also registered solid times in the 100 freestyle. At the 2018 State Open championships, Cannata was 10th in the 100 breaststroke (59.23). Richmond Le and Peter Levens are also senior captains. Le is one of the team’s leaders in the 100 breaststroke and Levens helps key the 100 freestyle and 100 backstroke events. “All three captains provide great motivation to their teammates,” McGorry said. A freshman, Shane Wynne has emerged as one of the Rams’ more versatile athletes. He provides depth in the 100 butterfly, 200 freestyle and 500 freestyle. “He has been very consistent and we can always count on him to step up and give his absolute best,” McGorry said. Junior Andrew Lou (50, 100 freestyle), freshman Vincent Zhu (100 breaststroke, 200 IM), senior Ankit Sahasrabudhe (100 butterfly), freshman Anmol Sapru (100 butterfly, relay events), sophomore Evan Levine (200 IM, 200 freestyle, 100 breaststroke), Justin Finkel (sophomore, 500 freestyle), Harry Hua (sophomore, 200 IM, backstroke) and Wesley Johnson (freshman, backstroke, relays) are among some of the swimmers who have ignited the team of more than 40 athletes. Thomas Cass, Greenwich: Finished first in the 500 freestyle (5:04.5) and the 200 freestyle (1:50.50) in the Cardinals’ win over Trumbull. Daniel Chen, Daniel Hand: Was the 200-meter individual medley winner against Fairfield Prep in 2:18.29. He won the backstroke in 1:05.35. Jack Crocamo, Seymour: Cromamo placed first in the 200-yard freestyle in 1:54, then touched the wall first in the 500 freestyle (5:30.41) in Seymour’s 88-82 loss to Naugatuck. Keegan Drew, Brunswick: Finished first in the 50 freestyle (22.14) and 100 butterfly (53.49) for Brunswick against Hopkins. Competed on the winning 200 freestyle relay squad (1:28.57). Ben Feldman, Westhill/Stamford: Won the 50 freestyle (23.20) and 100 butterfly (52.93) in a meet against New Canaan. Owen Glifort, Hamden: Glifort won the 50 freestyle (24.07) and 100 freestyle (52.09) for Hamden in its 97-89 loss against Lyman Hall/Coginchaug. Alex Hazlett, Brunswick: Hazlett registered first-place finishes in the 100 freestyle (48.57) and 200 freestyle (1:47.33) and was part of the Bruins’ winning 200 freestyle relay in the team’s 91-77 win over Hopkins. Sam Hanke, Cheshire: Posted winning times in the 200-yard freestyle (1:47.23) and the 100 backstroke (56.10) for the Rams, who beat Xavier 102-79. Jack Jee, Greenwich: Was the 200 IM (2:06.16) and 100 backstroke (58.11) winner against Staples and was part of the Cardinals’ first-place 200 medley relay team (1:47.37). Thomas Kehoe, Fairfield Prep: Kehoe finished first on the 1-meter diving event for Fairfield Prep in its 97-79 win vs. Daniel Hand. Patrick Keith, Hall: Produced first-place finishes in the 200 individual medley (2:09.54) and 100 freestyle (52.55) in Hall’s victory vs. Simsbury. Andrew Lou, Cheshire: Lou touched the wall first in the 50 freestyle (22.58) and the 100 freestyle (49.85) for Cheshire in its win against Xavier. Spencer Maher, Naugatuck: Posted winning a effort in the 100 butterfly (57.55 and was on the 400 freestyle relay squad that finished first in 3:44.37 against Seymour. 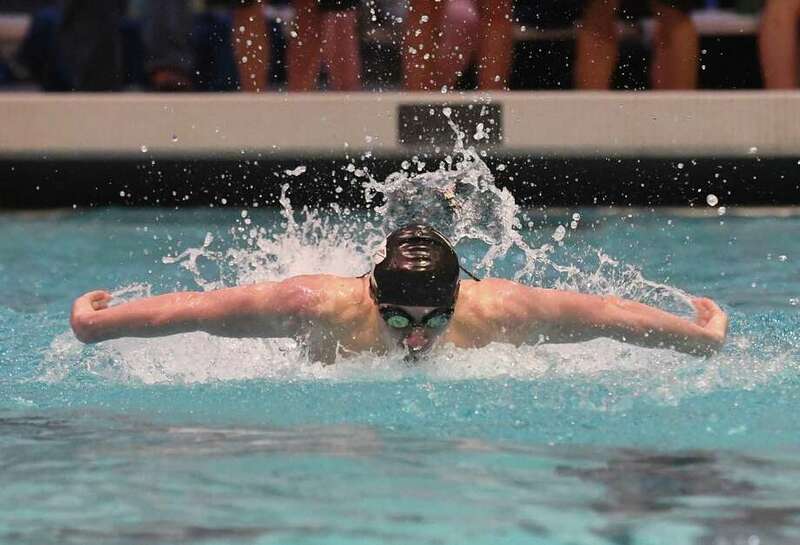 William McCleery, North Haven: McCleery took top honors in the 50 freestyle in 22.77 seconds, then won the 100 backstroke (59.56) for North Haven in its meet against West Haven/Platt Tech. Andrew Mitchill, Xavier: Took first in the 100 butterfly in 55.04 seconds and competed on Xavier’s winning 200 medley and 400 freestyle relay teams. Jake Ritz, New Canaan: Ritz was the 200 freestyle (1:5139) and 500 freestyle (4:58.78) winner for the Rams in their meet against Westhill/Stamford. Joel Satir, Greenwich: Won the diving event for Greenwich vs. Staples, totaling 261.75 points. Trumbull at Darien, Friday, 3 p.m.
Amity at Fairfield Prep, Tuesday, 7 p.m.
Norwalk/McMahon at New Canaan, Wednesday, 3 p.m.
Shelton at Hamden, Thursday, 3:30 p.m.